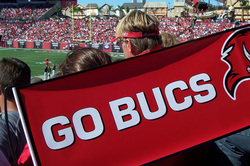 Tampa Bay Bucs football games are always fun and exciting days, whether it's your first game or you're a season ticket holder. This season, make sure you make it an absolutely epic day and go to the game with your buddies or your family in one of our luxury limousines from Lakeland Limo Services. You'll have the time of your life, and a day you'll remember for a very long time. We have a great selection of limousines that will make you feel like royalty on game day with truly epic limousine service in Lakeland, FL. You can pile in and enjoy our plush leather seats and ultimate sound system, and when driving down I-4 you will feel exhilaration and excitement. We have sedans, stretch limos, corporate limos, and a party bus, so let us know what works best for you and your party, and we will take care of the rest. You can see our entire fleet of limousines here. We can pick up our party at multiple locations so that nobody will have to worry about driving. You can focus on the game day festivities and a tailgating party for the ages. All while riding in an elite limo from Lakeland Limo Service. When you arrive at your tailgating destination, and roll into the lot, everyone will be in the mood for a party. It takes the game day excitement to a whole new level. Our professional chauffeurs will go out of their way to show you a great time in your Lakeland limo rental. So if you want to make some stops along the way, or after the game, let your chauffeur know what the big plan is. He will make every effort to accommodate your requests to make this day extra special for you and your party. After the game if you want to stop by and hit Ybor for a few hours, our chauffeurs will make it happen. You can bring anything on board with you, as long as it is legal. So this game day, take the hassle out of travel and let us pamper you like royalty. Call us at 863-201-4470 to reserve your limo now!